The children discovered at an “extremist Muslim” compound in New Mexico earlier this month were both trained to use firearms and taught multiple tactical techniques in order to kill teachers, law enforcement and other institutions they found corrupt, state prosecutors revealed on Monday. The prosecutors provided more details about the accusations during a court hearing in which they asked that Siraj Ibn Wahhaj and four other defendants be held pending trial on child abuse charges. But the judge in the case ruled against prosecutors’ request. Judge Sarah Backus said although she was concerned by "troubling facts," prosecutors failed to articulate any specific threats to the community. She set a $20,000 bond for each defendant and ordered that they wear ankle monitors and have weekly contact with their attorneys. Wahhaj is the son of a Brooklyn imam, also named Siraj Wahhaj, who was named by prosecutors as an unindicted co-conspirator in the 1993 World Trade Center bombing, the New York Post reported. The elder Wahhaj, who heads Masjid At-Taqwa mosque, was a character witness in the trial for Sheik Omar Abdel Rahman, the notorious “blind sheikh” who was convicted in 1995 of plotting terror attacks in the U.S. 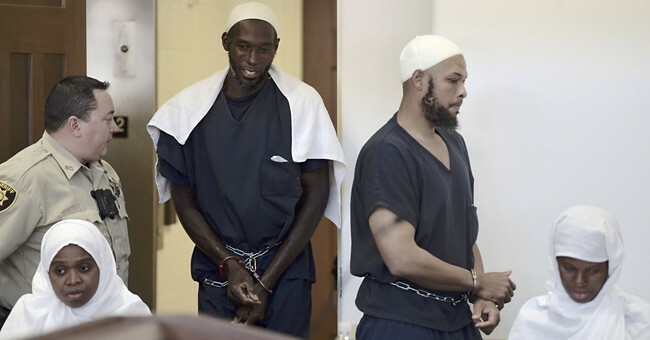 BREAKING: The suspects in the #NMCompound child abuse case will be released on a signature bond. THAT MEANS THEY WILL NOT HAVE TO POST ANY MONEY TO BE RELEASED. Not a threat to the community, huh? These kids weren’t there for summer camp. We’ll keep you updated. The young boy whose remains were found at a compound in New Mexico died in a religious ritual conducted because his father believed he was possessed by demons, prosecutors alleged Monday. The boy's remains were discovered Aug. 6 after Taos County authorities raided the ramshackle compound near Amalia, where they found five adults and 11 children, ages 1 to 15, at least two of whom prosecutors said Monday were being trained to attack schools, banks and other institutions. The boy hasn't officially been identified, but Siraj Wahhaj, a well-known imam at the Al-Taqwa mosque in Brooklyn, New York, has said the child was his grandson, Abdul-ghani Wahhaj. Abdul-ghani, who would have turned 4 years old last week, disappeared from his home in Georgia in December. A nationwide search eventually led authorities to the compound in Taos, which was set up by the imam's son, Siraj Ibn Wahhaj, 40, who authorities allege had kidnapped his son.